Former U.S. national criterium champion Eric Marcotte (Team Jamis) won for the second straight year and third time in three participations Sunday in front of a massive crowd at the Thompson Bucks County Classic. Marcotte bettered fellow American Robin Carpenter (Holowesko-Citadel presented by Hincapie Sportswear) and reigning Colombian national road champion Edwin Avila (Team Illuminate) in the sprint to the line at the end of the 63-mile USA Pro Road Tour event through the streets of Doylestown, Pennsylvania. 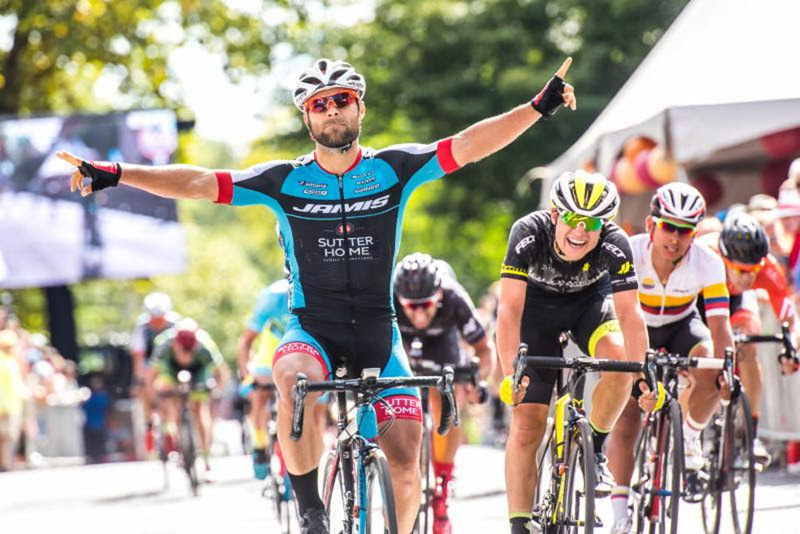 On Saturday, Marcotte had finished runner-up to Carpenter's teammate, Oscar Clark, in a two-man breakaway that decided the Reading 120 "Classic of the Americas" road race. In Sunday's two-hour and 22-minute criterium, the 2015 national criterium champion and 2014 national road champion said he found himself in a more favorable situation. With eight laps to go, Marcotte was part of a 17-man group that formed when a breakaway was reeled in. "I got in that move and the numbers of riders from other teams played out today in my favor," he said. "Yesterday, I was behind the ball trying to stay ahead of the Holowesko team. This time there were some teammates, so it benefitted them to stay ahead and I could sit in and keep the momentum and save it for the last sprint." Prior to Sunday, the 36-year-old from Scottsdale, Arizona, had scored wins this year at the Valley of the Sun road race and the Stage 4 criterium at the Tour of the Gila. In addition to winning Sunday and last year, he also was victorious the only other time he competed in Doylestown, in 2012. "This is a hard crit," he said afterwards, addressing the crowd of several thousand who filled the streets near the finish line. "You are on the whole gas the whole time, accelerating out of the corners, there is lots of wind and everybody is tired from yesterday. In attrition races, I do well. I am very thankful for Jamis to give me a ride this year to show my talents and show off their bikes." 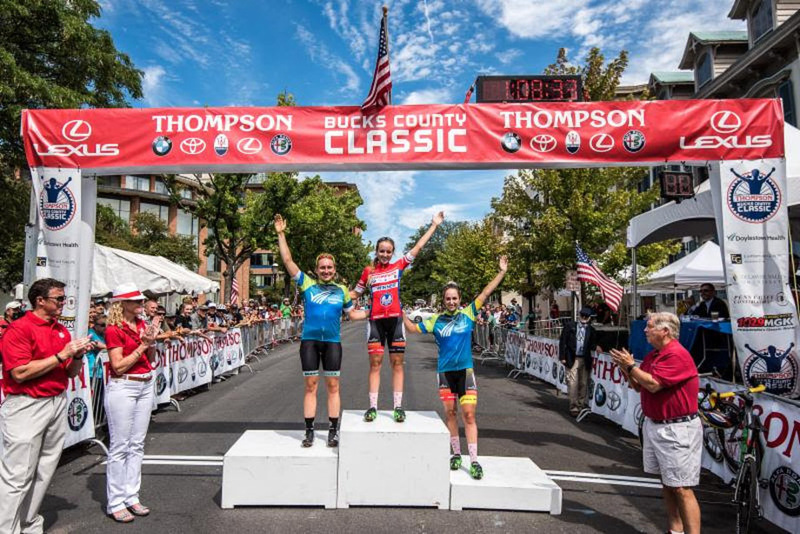 In the Thompson Bucks County Classic professional women's criterium sponsored by Doylestown Health, Skylar Schneider capped an impressive performance by the ISCorp presented by Smart Choice MRI team. Schneider's teammate, Josie Talbot of St. Charles, Missouri, appeared to have built enough of a lead to take the win after an attack only three laps into the 20-lap, 23.8-mile race. But her impressive 45-minute solo effort was stopped short by a concerted chase by the Fearless Femme team in the last few laps. "It was a very Fabian Cancellara-type performance," Race Director John Eustice said of Talbot's decision to go-it alone for so much of the race. Cancellara, a multi-time world time trial champion and classics expert who is retiring this year, was renown for his epic solo attacks in some of the world's biggest races. As Talbot was reeled in, one of her teammates, Yussely Soto attacked with two laps to go. After she was quickly brought back, Skylar Schneider burst out of the field and only San Diego's Gretchen Stumhofer (Colavita-Bianchi) could follow. "So many races this year, have finished in breakaways," Schneider said. "I think that shows how strong the women are. I am feeling pretty happy to have pulled off the win against such strong women." Schneider, a 17-year-old from West Allis who has been racing bikes for 13 of them, freewheeled across the line nine seconds ahead of Stumhofer. Schneider's older sister, Samantha, took the field sprint for third. 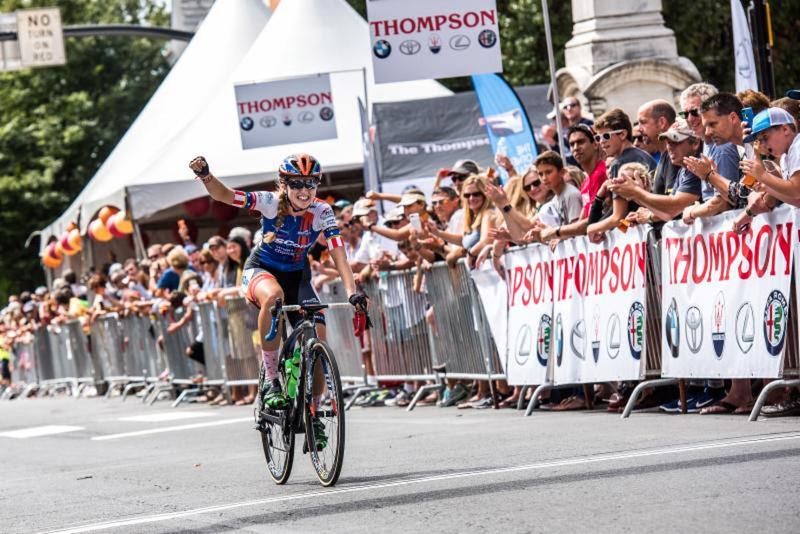 Samantha recently clinched the inaugural women's Pro Road Tour title to go along with the PRT team title won by her ISCorp presented by Smart Choice MRI squad. "This was a fun race to come to," Skylar Schneider said. "We had never been here before, but our team executed well and I am really proud of them." In business since 1969, The Thompson Organization includes Thompson Toyota, Scion, Lexus, Maserati and BMW and Thompson Rent A Car, located at Routes 313 and 611 in Doylestown, as well as the Thompson Detail Center located on N. Broad Street in Doylestown, and the Thompson Collision Center located on Route 611 in Plumsteadville. For more information on the Thompson family of automotive dealerships, please visit www.1800Thompson.com. Lexus launched in 1989 with a commitment to the Pursuit of Perfection. In its ongoing pursuit of innovation, Lexus is pushing the boundaries of technology and craftsmanship. The exciting new Lexus lineup showcases the brand's commitment to bold and dynamic design, creating a signature look and feel for the luxury brand. The combination of "aggressive elegance" and a more powerful road presence make Lexus vehicles more alluring than ever. Visit www.Lexus.com. Doylestown Hospital is the flagship of the Doylestown Health system, a connected system of inpatient, outpatient and community services. Doylestown Hospital is nationally and regionally recognized for high quality and innovation. The Hospital has 232 beds and a Medical Staff of more than 425 physicians offering comprehensive healthcare services from childbirth to end-of-life care. For more information: www.dh.org. The tradition of excellence at the law firm of Eastburn & Gray, P.C. began over 130 years ago and continues today. With law offices in Doylestown, Bucks County and Blue Bell, Montgomery County, Pennsylvania our experienced attorneys provide high quality legal services throughout Pennsylvania and New Jersey. As a full service firm, Eastburn & Gray attorneys practice in many diverse areas of the law, enabling us to effectively meet the needs of all clients. Learn more at www.eastburngray.com. Founded in 1933 by George E. Otto and Robert C. Crowell, Penn Valley Constructors, Inc. has been providing its customers with quality and value for nearly eight decades. The tradition continues under the management of Jonathan E. Otto, President and J. Peter Grover, Vice President and Chief Financial Officer. As Construction Managers and General Contractors, we specialize in industrial, commercial and institutional construction. Please visit www.pennvall.com for more information. The USA Cycling Pro Road Tour (PRT) showcases the premier domestic road calendar events in the U.S., including criteriums, road races, stage races and omniums. Over six months and spanning from coast to coast, the PRT will include overall individual and team rankings for men and women, crowning PRT Champions following the 26-event calendar. The Pro Road Tour features the nation¹s top Pro-Am road race events, boasts a total prize purse of more than one million dollars and is open to both professional and amateur cyclists. Championship Cycling creates and implements international bicycle races and the television productions of them. We specialize in UCI and USA Cycling Pro Road Tour races, ones that require the highest levels of technical expertise and experience.